Want to cook rice in the serving bowl or along with an entree? 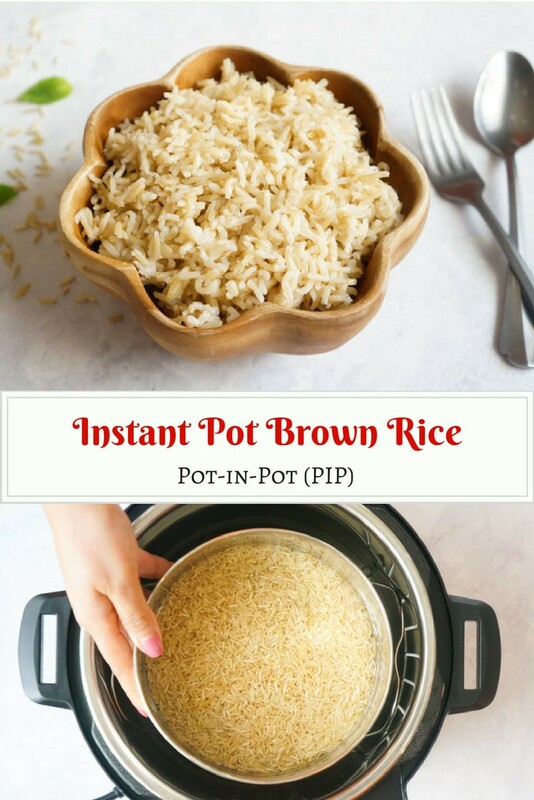 Instant Pot Brown Rice Pot-in-pot (PIP) is the perfect solution for you. Here is a step-by-step guide to PIP brown rice. One of the reasons to love the instant pot is perfectly cooked brown rice. I always had trouble cooking brown rice perfectly on the stovetop, so I love that I can set the time, walk away and come back to perfectly cooked rice. If you want to make Brown Rice in the main pot, you can find the recipe here – Instant Pot Brown Rice. Here is the White Basmati pot-in-pot recipe – Instant Pot Basmati Rice PIP. Or try this delicious Cilantro Lime Brown Rice. There is a big debate over which rice it better. 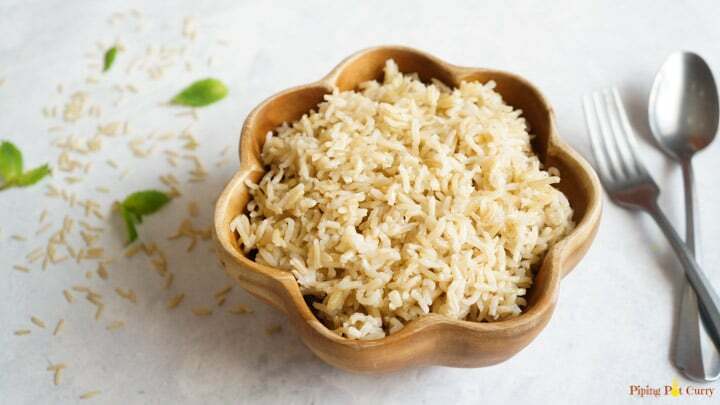 All rice consists almost entirely of carbs, with small amounts of protein and practically no fat. 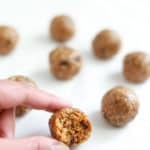 Brown rice is a whole grain, which means it contains all parts of the grain — including the fibrous bran, the nutritious germ and the carb-rich endosperm. Brown rice has more fiber and antioxidants, as well as a lot more important vitamins and minerals. White rice has had the bran and germ removed, which are the most nutritious parts of the grain. This leaves white rice with very few essential nutrients, which is why brown rice is usually considered much healthier than white. On the other hand, brown rice contains the anti-nutrient phytic acid which reduce our body’s ability to absorb certain nutrients such as iron and zinc. Brown rice may also contain higher amounts of arsenic, a toxic chemical. However this is only a concern if you eat a lot of rice. With the above facts, I am not recommending either one is better. You make the choice! I prefer to include both brown and white rice in our diet. 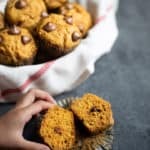 You can cook a complete meal at once and save precious time. With entree in the main insert and brown rice in a bowl on a trivet. 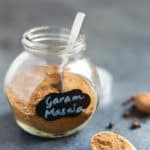 See video to cook Dal Makhani (Madras Lentils) or Rajma (Red Beans Curry) along with brown rice. 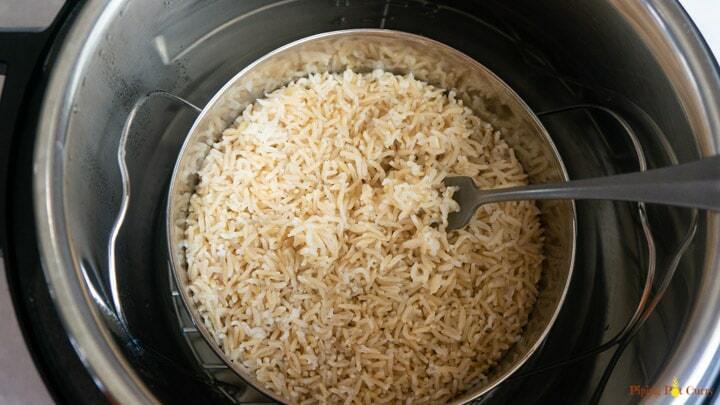 What do you need to cook pot-in-pot Brown Rice in the Pressure Cooker? To cook pot-in-pot brown rice, you need a trivet and a pot you can place on the trivet. If I am preparing only brown rice, then I use the trivet that came with the instant pot. If you are cooking an entree along with the rice, you would need a long legged trivet. Here are the pots I have, which my mom got from India. 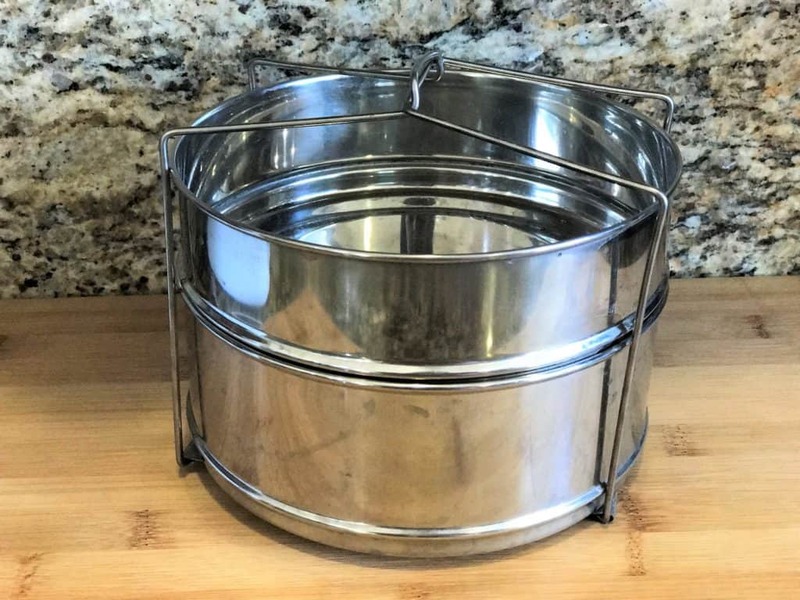 But you can find similar one’s on Amazon – Ekonova Stackable Stainless Steel Insert Pans. I have also done PIP for rice in a Pyrex glass bowl, but these need a couple extra minutes to cook the rice. 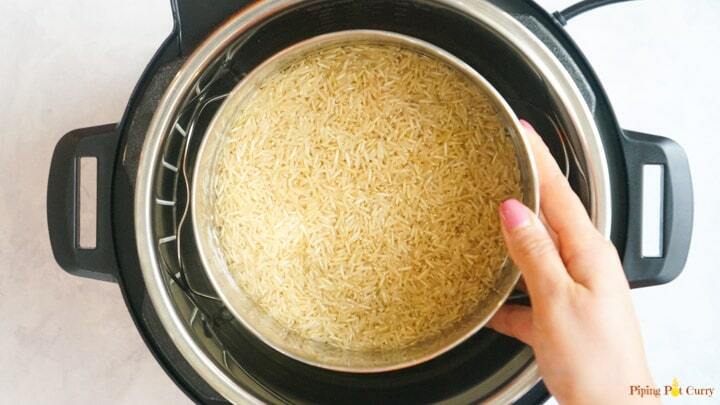 How to cook Pot-in-Pot Brown Rice in Pressure Cooker? 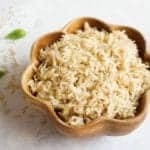 I use brown basmati rice in this recipe, however you could use any brown rice (Note: these are not the quick cook rice). Our favorite is Royal brand Brown Basmati Rice. Whenever I make them, so many people ask me about the perfect long grains. They are available on Amazon, give it a try. This is a no soak method. Wash the rice and drain all the water used for washing. Add 1.25 times the water as the brown rice added. If you like, add ghee/oil and salt to it. We love to add ghee in our rice, it gives a wonderful aroma and flavor to the rice. I like to have rice al dente, and separate. I don’t like sticky or mushy rice. Hence I use a 1:1.25 rice to water ratio, which has consistently given me perfect results. Traditionally cooked brown rice in a saucepan needs double the amount water than the rice. 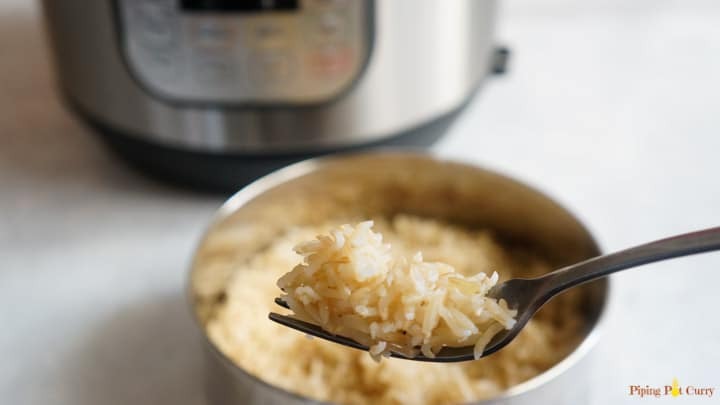 However in the instant pot, less water is enough to get perfectly cooked rice. Add 1 cup water to the main instant pot insert and place trivet in the pot. Now place the pot with brown rice and water on top of the trivet. Set the instant pot on manual mode for 25 minutes. I have tried multiple timings, and found that anywhere from 22-30 minutes works. 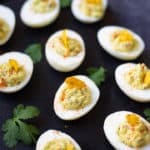 When the instant pot beeps, let the pressure release naturally. Then fluff the rice with a fork. Look at the perfect, separate grains of rice. Enjoy this perfect basmati rice with any curries such as Coconut Shrimp Curry, Butter Chicken and Dal Makhani. Want to try Quinoa? Check out this perfect quinoa in the instant pot. Some other popular rice recipes – Rice & Vegetable Pilaf, Lentil & Vegetable Khichdi and Cumin Rice. Perfect Pot-in-pot brown rice made in the pressure cooker. Great to prepare brown rice along with the entree or right in the serving bowl. Wash the rice and drain water. Add the rice to the bowl for pot-in-pot cooking. Add water for cooking rice in the bowl. Optionally add ghee/oil if you prefer. Add 1 cup water to the main steel insert of the pressure cooker. Place trivet in the main insert. Place the bowl with rice and water on the trivet. 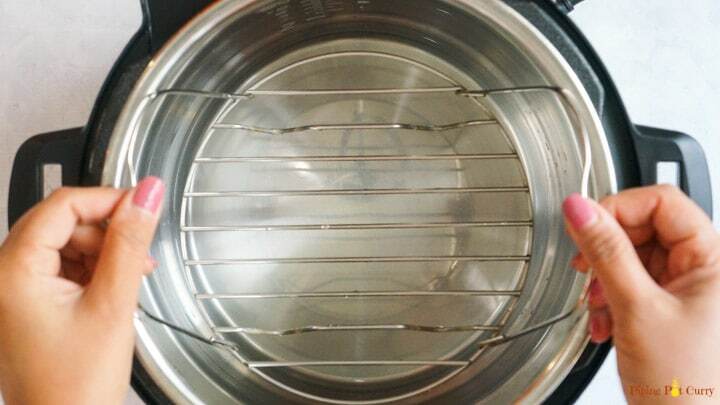 Close the lid of the pressure cooker with vent in sealing position. Set in pressure cook or manual mode for 25 minutes at high pressure. When the pressure cooker beeps, do a Natural Pressure Release, which means let the pressure release by itself. Fluff the rice and it is ready to be enjoyed. When cooking brown rice with an entree, consider the cooking time for the entree. If it takes 22-30 minutes to cook the entree, then it will work to cook pot-in-pot rice with the entree in the main insert. If the entree needs 5 minutes to cook, while the rice needs 25 minutes, I do not recommend doing pot-in-pot brown rice with the entree (consider white rice in this case). I cooked my brown rice as you instructed and left it in the “keep warm” mode for about 45 minutes, and it really was perfect! Thank you so much. 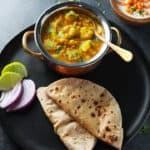 If I’m cooking rice pot-in-pot at the same time as a curry (or some other main dish), does that dish need to have the same cooking time as the rice? Thanks! Hey Candace – The curry can have up to 6-10 minutes more cooking time. Eg. I cook Red Kidney Beans Curry (Rajma) with pot-in-pot brown rice, where red beans take 30 minutes at high pressure/bean chili mode and brown rice take about 22-25 minutes pot-in-pot. Thank you your recipe instructions were very easy to follow and understand. Hey Marcia – Glad to hear that the recipe worked well. Thank you for sharing back your review. will the timing be the same for brown sona masoori rice also? Also, can we use any stainless steel dish along with the insert ?or only Ip specific. Hey Janani – Sorry, I have not cooked brown sona masoori rice so will not be able to recommend a time for that. You can use any steel bowl in the instant pot, it does not have to be a special one for instant pot. Do you put the cover on the pot, or leave it open? Hey Sandra – I leave the bowl used for pot-in-pot uncovered and close the instant pot lid to pressure cook. Hope that helps!